On Kyffhaeuser and the Kesselberg they were already installed, now they are also on Sudelfeld for motorcyclists ensure to keep away and improve accident statistics – rumble strips. What really cause rumble strips? In practice, rumble strips cause more negative, and the desired effect (less rage) remains out. Many motorists do not know rumble strips and front brakes from extremely strong, which can lead to rear-end collisions. By the strip itself usually increases even the noise level (by brake, accelerate and drive around), so that residents are usually harassed even more than by the motorcyclist before. Often complain cyclists, since the strips for they often can pose a risk of falling. In winter, it is problematic to clear snow, which increases the risk of accidents again. 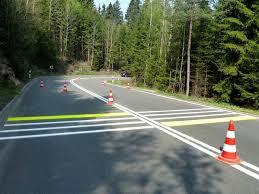 Depending on what is installed can also offer very little grip a wet rumble strips. Fewer accidents there should be according to statistics, but I believe any statistics you did not fake yourself … Who is to say that it was simply not there more controls and therefore the number of accidents have dropped? Not less smash through rumble strips anyway. A driver who has come to the knee grinding and wants to take the curves faster really can not stop them. You drive over the rumble strips the faster, the less you notice it! So why should then make a slow speeders ??? In the curves themselves so no rumble strips are installed, because it would be too dangerous there. … just an excuse that made ​​what to rage and the “many” accidents. Residents should be reassured. Bring it does in practice, but absolutely nothing is wasted except that money and the residents are usually harassed even more. A hazard can occur through the rumble strips also !! !